Many moons ago, the Persians and the Greeks were fighting a war against each other. In Greece, two major cities had formed, Athens and Sparta. They were a large distanced away from each other and decided they needed each other’s help to defend their lands from the Persians. The Athens needed the help of Sparta. 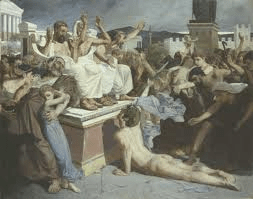 Time was short, so the Athenian generals send Phidippides (or Philippides) a professional runner to Sparta to ask for help. The 140 mile course was very mountainous and rugged. Phidippides ran the course in about 36 hours. Sparta agreed to help but said they would not take the field until the moon was full due to religious laws. This would leave the Athenians alone to fight the Persian Army. Phidippides ran back to Athens (another 140 miles!) with the devastating news that no help would arrive in time. The Athenian Army was outnumbered, but they had a surprise attack plan that worked. By day’s end, 6400 Persian bodies lay dead on the field while only 192 Athenians had been killed. Phidippides was again called upon to run to Athens (26 miles away) to carry the news of the victory and the warning about the approaching Persian ships. Despite his fatigue after his recent run to Sparta and back and having fought all morning in heavy armor, Phidippides rose to the challenge. Pushing himself past normal limits of human endurance, the reached Athens in perhaps 3 hours, delivered his message and then died shortly thereafter from exhaustion. 1. The guy ran 140 miles to ask for help. He didn’t get to have a carbo-load pasta dinner, hear the featured speaker, tour the expo or get a pre-race stretch. He just donned his fig leaves and took off. They said “Sure! but in a few days”. 3. Before he could enjoy his post-run massage and write a race report, Phidippy had to fight a big ol’ war. They won! He really needed some electrolytes and a nap. 4. They called him up to run BACK to Athens to tell them they had won the war. It was only 26 or so miles to Athens, so off he went. 5. He gave them the good news and died. And for some crazy reason, millions of insane people around the world train to run this same distance in hopes of being one of the top 2% of the world’s population to finish a full Marathon—26.2. miles. And I want to be one of them in 5 short weeks. But I promise I will be wearing a whole lot more than this guy. Why in the world did this artist assume Phidippy ran 300+ miles without a stitch of clothes? To be perfectly blunt, I bet he had to wear something to stop that constant flopping.